The Victoria Hotel Footscray has reopened after a transformation from the down-at-heel Harts Hotel thanks to new owners Anthony Hammond (co-owner of the excellent Builders Arms in Fitzroy) with business partner Nick Carter plus Anthony’s wife Jo deFina. Much of the dark wood and brick interior has been retained, albeit spruced up a lot. Inside there’s booth seating for groups, smaller tables in the dining room and a small airy internal beer garden. The menu by James Cornwall includes classic pub meals as well as some more adventurous gastropub fare. From the small plates we try the chicken hearts with endive, fig and hazelnuts, the steak tartare and mussels. The chicken hearts ($14) are not very palatable on their own and are much improved in the same forkful as some fig and endive. The texture of the heart is exactly as you’d imagine too – it’s like eating a small muscle/chewy mussel. It’s an interesting dish without being something I’d be returning for. 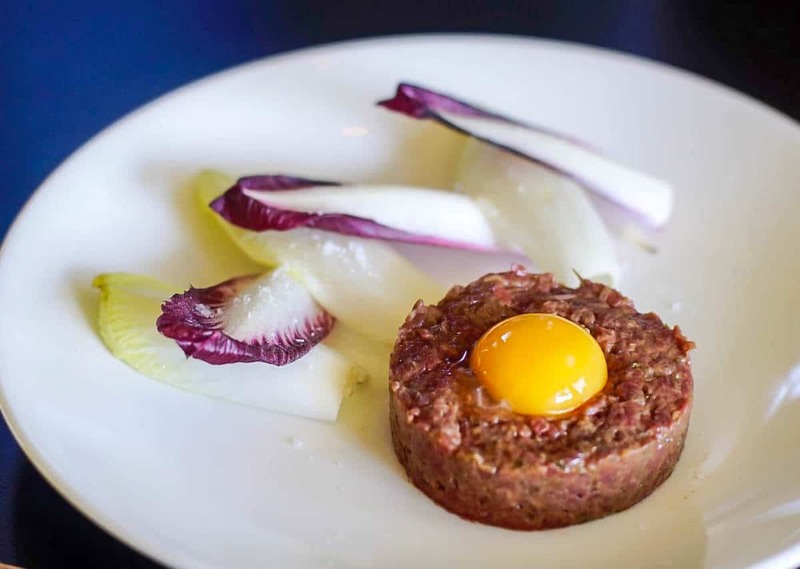 The steak tartare is pretty classic and highlights the quality of the meat $16. None of us can work out what ‘bulldog sauce’ is. The mussels are the best bargain – the mussels are fresh and fleshy and a $15 bowl can easily be a light main meal. From the main meals we order the schnitzel ($25) and fish and chips ($24). Both of the dishes are good without being spectacular and could do with some uplifting presentation beyond a plate of beige. A big tick to their fries, which have their skin on and shaped like they’ve been cut from an actual potato. Industrially-made fries charged at $5+ are my pet hate! The main meals are all around the $24-$28 mark and only steaks costs more. Most people don’t go to the pub to eat dessert but in this case the sweets are our meal’s highlight (both $9). The cinnamon waffle is fluffy on the inside, crispy on the outside, while the mango soft serve is addictively punchy. It tastes almost like that fake mango flavour you get in Chinese mango pudding. The chocolate tofu mousse is rich and dense and the chocolate crumb and berries gives the mousse the perfect textural contrast. Share this one unless you want to fall into a food coma. 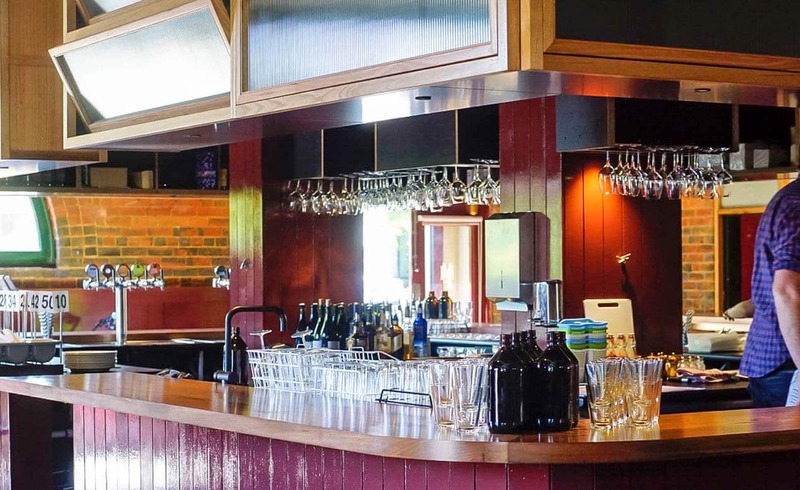 Victoria Hotel Footscray is an affordable local boozer that the west already loves – but be aware that the staff are still finding their feet. There is only two till points for four sides of the bar, making the wait for ordering food and drinks longer than desired during busy periods. There’s also a minor mixup with cutlery, crockery and water during our non-peak time visit. Not a big deal, and hopefully something that will be quickly ironed out as itbecomes Footscray’s new favourite pub. Victoria hotel is one of the good hotels, I have enjoyed food already with my family there. KaBloom Flower Festival at Tesselaar Flower Farm – Giveaway!